The cold winter weather has me thinking about travel, vacation, and escape from the snow! This week’s storytime was all about travel and adventure.My first book was “Whiteblack the Penguin Sees the World” by Margaret and H.A. Rey. This book was a bit longer than what I would normally read, but a fun and engaging story (by the same authors as “Curious George”, incidentally). 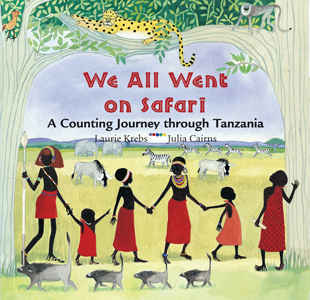 Since this story was lengthy, I followed it with a short, fun book called “We All Went On Safari” by Laurie Krebs.